There are 7 online now! Originally, Walton was a farming village situated miles inland, and it did not become a coastal region until the 1700s. Over the centuries large quantities of land were lost to the sea due to coastal erosion (known as the prebend of “Consumpta per Mare”). Archaeological digs have suggested that the Romans occupied the area, followed by the Saxons, who named the place Weala tun (a place of farmers of the Britons). Untill 1800, huge parts of the medieval settlement have been washed away, culminating in the loss of the All Saints church in 1789. In 1800, the community of Walton consisted of 250 inhabitants, with neighbouring Frinton housing only 30. Its history as a seaside resort began in the early 19th century. In those days it is likely that people from the district were the main visitors to the seaside town. As its popularity grew Walton began to rival many other seaside towns. The railway and the building of the pier (suitable for steamboats) contributed to the expansion of the town, Walton became quite popular in Victorian times. After the Second World War Walton’s popularity as a seaside resort declined. The Naze tower was build in 1720 to serve as a lighthouse for ships going to Harwich. 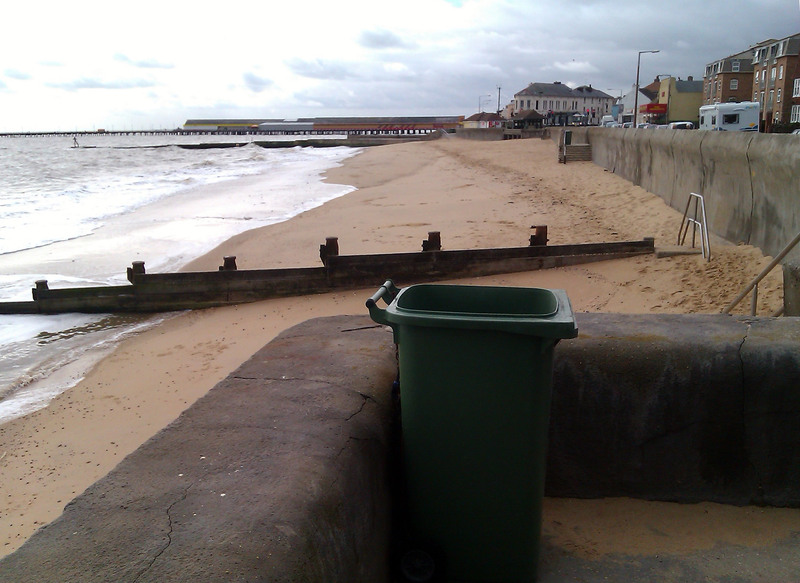 Today, the town of Walton is protected by a concrete sea wall and wooden groynes. This coastal protection line starts south-west of Clacton and goes up to the Naze where it leaves the last mile unprotected. The Naze itself is eroding heavily. Pillboxes from the Second World War have fallen from the cliff and are lying on the beach, illustrating how fast coastal erosion continues (1-2 metres per year). If erosion is not stopped, the Naze tower is likely to be lost to the sea within the next 50 years and the Naze might become an island. The LOST TOWN feasibility study included an evaluation of alternative sites for the project, all along the East Anglian coast. Due to its landscape qualities and historic assets, Walton-on-the-Naze turned out to be the most suitable location for the LOST TOWN project. Walton-on-the-Naze constitutes a high-quality environment for the LOST TOWN project: Walton shows a massive example of coastal erosion on the Naze and has a history of land loss. The educational aspect of the LOST TOWN project is highly emphasised if confronted with today’s ongoing reality of coastal erosion. The pillboxes from the Second World War on the beach and the Naze Tower, threatened by coastal erosion, witness the process. Walton has the second longest pier in the UK, offering additional viewpoints on the sculpture. Furthermore it could be used for boat trips towards the sculpture. The sculpture is also visible from Harwich and Felixstowe, it will become a symbol for the whole Haven Gateway Area. It is 7 ½ miles south from Harwich by water and 15 by land, 7 ½ east-south-east from Tendring, 19 ¾ east from Colchester and 71 ½ from London. In the North Eastern division of the county, Tendring hundred, petty sessional division and union, Harwich county court district, rural deanery of St. Osyth, archdeaconry of Colchester and diocese of St. Albans: this and the adjoining liberties of Thorpe and Kirby are called the Sokens, from the A. S. soc, Scand. soke, a place privileged to hold local courts. Other peculiar privileges enjoyed were exemption from archidiaconal and commissary jurisdiction, power to administer and execute laws for themselves and the equal right of a wife with her husband in the ownership of land. This parish once extended much further seawards, and ruins are said to have been discovered on a shoal called the West Rocks, 9 miles from shore; the town lies between the sea-cliffs and Walton Creek, which is much frequented by sportsmen in quest of wild fowl, and on the head of the creek stand powerful tide and wind mills. The air is salubrious and bracing, and the beach, consisting of sand and fine shingle, is well adapted for bathing, and affords a pleasant promenade, the ebb tide leaving a hard smooth sand: the cliffs adjoining the town have been protected from the encroachments of the sea by the construction of breakwaters, and a Bill was passed by Parliament 4th Aug. 1890, affording the necessary powers for repairing the sea wall, a work carried out in 1892, which with later additions and the making of new road &c. has cost nearly £20,000. The land between Walton and Frinton, overlooking the sea, and called the “South Cliff Estate,” is now (1902) being laid out for building. The land here is chiefly composed of dark London clay, and at the Naze this is overlaid by the crag formation, famous for its abundance of fossils. The red crag here found is considered the oldest in England and alone of all the red crag beds yields shells in the condition in which their inmates died. Fossil remains of antediluvian beasts have also been found: pyrites and coprolites from the London clay and upper beds are collected on the shore and cliff as well as nodules of calcareous clay of septaria used for making paster of paris. Copperas works formerly existed here and a considerable quantity of the mineral is still obtained from the beach. The town is lighted with, gas, and provided with a constant supply of pure spring water from Mistley, by the Tendring Hundred Waterworks Company. A scheme of drainage by gravitation on the septic tank system was completed in 1902 at a cost of £10,000. At the head of the pier is a large pavilion, for concerts and other entertainments, and seating 400 persons. During the summer season, steamers run to and from London, Clacton-on-Sea, Harwich, Felixstowe, Southwold, Lowestoft and Yarmouth, and several times a day from Harwich up the river Orwell to Ipswich. The church of All Saints, parially rebuilt of stone in 1873, was completed, except the upper portion of the tower, and consecrated in 1882. It is an edifice in the Early Decorated style, and consists of chancel with vestry and organ chamber, nave of five bays, south aisle, and an embattled western tower completed in 1896 by Col. Richard Percival Davis, at a cost of £1,500, and containing 2 bells and a fine clock with 4 dials placed at the same time by the parishioners at a cost of £160. The stained east window was placed in 1901, as a memorial to Peter Schuyler Bruff esq. C.E. of Ipswich. The oak lectern was presented in memory of John Winchester, 22 years schoolmaster, and a new oak reredos has also been provided. The organ was erected in 1882: there are about 600 sittings: the old church, a structure of red brick, was consecrated by Bishop Porteus in 1804 in place of an ancient edifice, which, with the churchyard and every house near it but one, had been entirely swept away by the encroachments of the sea in 1798. The living is a vicarage, net yearly value £119, with 1 acre of glebe and residence, in the gift of trustees, and held since 1898 by the Rev. John Henry Heywood M.A. of University College, Oxford. A small iron chapel of ease, in Foundry lane, was opened in 1902, at a cost of £70, and will seat 100 persons. The Primitive Methodist chapel, in Station street, built in 1875, will seat 100 persons. The Society of Friends’ Meeting house, in Martello road, is open during the season. The Congregational church in Station street was erected in 1878 and has 360 sittings. The Plymouth Brethren have a meeting house of brick, in Saville street, erected in 1901, with 150 sittings. The Town Hall, erected in 1900, is a large structure of red brick, with stone facings; on the ground floor are the post office, bank chambers, council room and private offices and shops; there is also a large hall, with a smaller hall above, and licensed for dramatic, musical and dancing entertainments, and also available for public meetings; the large stage will hold fully 150 persons, and the total seating capacity is about 700; the upper floors have offices, retiring rooms &c.
The Public Hall, in High street, a large structure of brick holding 300 persons is used for public meetings. An extensive iron foundry here belonging to R. Warner & Co. finds employment for 150 to 200 hands. The brick earth and strong clay are being manufactured into bricks of a good quality at the Port Walton works, by Donald Mackenzie & Sons. There are several good hotels, including the “Marine,” “Pier,” “Portobello” and: “Royal Albion”; attached to the “Marine” is an assembly hall holding 300 persons, and the “Royal Albion” has a large hall for which music and dancing licences have been granted and holding 400 persons, but for concerts, 500 can be seated; connected with the Pier hotel by a subway is the Round Garden, a tastefully laid out enclosure containing refreshment rooms. A fair was formerly held here on July 3rd, but has now become obsolete. The coastguard station, at the east end of the town, was erected in 1891; the force consists of a chief officer and 11 men. This station has direct telephonic communication with the Gunfleet lighthouse, the post office and the Harwich and Clacton-on-Sea coastguard stations. This boat was superseded in 1900 by the “James Stevens, No. 14,” a 43 ft. sailing boat, forming one of a series of 21 boats presented to the institution by the gentleman of that name. The Claughton Convalescent Home on the Parade, established in 1885, is an offshoot of the St. Albans Diocesan Nursing Institution, and is supported by voluntary subscriptions. The Home of Rest in High street, connected with the Field Lane Mission in London, is used in the summer months for the benefit of the poor invalids requiring the sea air. There are about 30 acres of land, left chiefly by Mr. John Sadler, in 1563, for the good of the poor, the income of which is managed and distributed by trustees, under the direction of the Charity Commissioners. Two parcels of land formerly belonging to the poor and yielding respectively £15 and £4 10s. annually have been submerged, as also the greater portion of two farms comprising 90 acres of land purchased in 1793 by the governors of Queen Anne’s bounty for the augmentation of the living of Holy Trinity church, Colchester. Sir John Henry Johnson, of St. Osyth’s Priory, Col. Richard Percival Davis, of 37 Gloucester terrace, Hyde park, London W., the trustees of the late Robert Warner esq. The Land Co. 68 Cheapside, London E.C. and Messrs. John Carter and Edward Standley, are the principal landowners. The soil is fertile, consisting chiefly of loam, crag and sand; subsoil, clay and gravel. The chief crops are wheat, barley, oats &c.
The parish, contains 2,096 acres of land, 45 of water, 159 of tidal water and 902 of foreshore; rateable value, £8,723; the resident population in 1871 was 1,070; in 1881, 1,376; in 1891, 1,586, and in 1901 was 1,969; but in the summer season it is about 6,000; the population of the Urban District in 1901 was 2,007. The rateable value is £7,325.